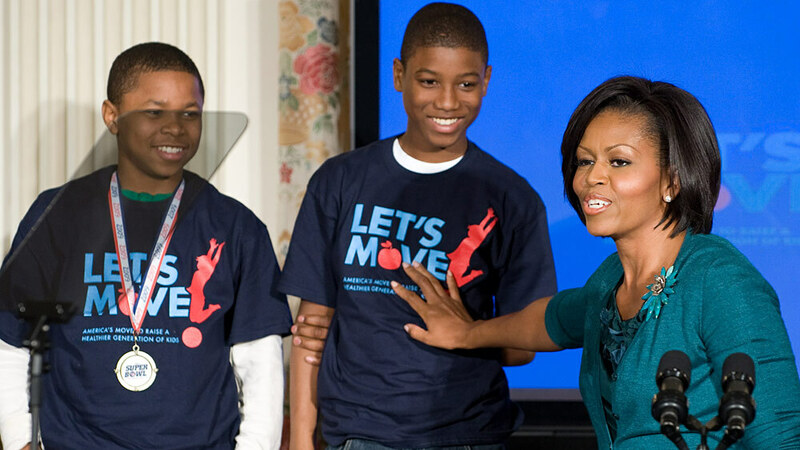 First Lady Michelle Obama, alongside members of the 2009 National Championship Pee-Wee football team, the Watkins Hornets, speaks about her initiative 'Let's Move' during a Tuesday event at the White House. The campaign aims to combat childhood obesity. During Wednesday's snowy edition of a Tell Me More, we talked about first lady Michelle Obama's newly launched campaign to tackle child obesity. But in case you missed that conversation -- or even if you did catch it -- there are a few more interesting tidbits about the Let's Move initiative that are worth mentioning. Mrs. Obama attributes her sensitivity about childhood obesity to her own days as a working mom (married to a busy, political-type, rising-star of a husband). Before moving to the White House, she had little time to prepare healthy meals for young daughters Sasha and Malia. The first lady recalls all too often choosing selections from the Chinese carryout or pizza joint over healthier options such as fresh fruits and vegetables. She says that's when a Chicago doctor schooled her on how to, literally, change course. And eating for the Obamas has been much greener and fresher and healthier in the days since. But one can't help but ponder how much easier healthy eating might be for children living in a dual-income household with two ivy leaguers as parents, and, how much more convenient healthy eating becomes after moving into the White House where expert chefs cater to even the most picky culinary preferences. And just how difficult could it be to avoid becoming a chunky kid when you have a vegetable garden just outside your door and vast green lawn to hula-hoop on? I know, more money, more problems, right? "Nice things" aren't everything. A kid can be both wealthy and chunky. It's about motivation. Yada, yada, yada. The larger point is that -- as "Let's Move" hits the ground running -- some will challenge the initiative by arguing that not everyone has the same resources as the well-intended (and affluent) Mrs. Obama. Tell Me More has reached out to the White House, so we hope to have the first lady on our program to specifically answer that question and discuss the nuances of her new initiative. -"Let's Move" includes the Healthy Food Financing Initiative, which will invest $400 million annually to bring grocery stores to "underserved" areas and offer incentives for neighborhood convenience (or "corner") stores to carry healthier food options. -The U.S. Department of Agriculture will partner with schools across the nation to help them meet guidelines set by the Healthier U.S. Schools Challenge Program, which "establishes rigorous standards for schools' food quality, participation in meal programs, physical activity, and nutrition education." -"Let's Move" will aim to help schools implement provisions made by The Child Nutrition Act. Earlier this year, President Obama announced a proposed increase in the federal budget of $1 billion annually (over the next 10 years) to make meals served at all schools healthier. And, hopefully, we can get her to tell us more.